When a famous leader of nations is forced to recognise he is no more than a frail human being like everyone else, he implores the people around him to help him understand what the story of living is worth, and what it means to die - “let us sit upon the ground and tell sad stories of the death of kings…”, Richard II asks his friends. We ask you to do the same this summer. To sit upon the ground in one of Sydney’s most beautiful outdoor theatres, to tell stories, to revel in poetry, to think as a community about what nationhood and leadership mean, and to bear witness to how Richard II’s deposition, the first formal party room meeting to spill an English king, sets in motion an extraordinary ricochet of political fractures that William Shakespeare turned into the greatest study of leadership, human competition and ambition ever penned. This summer Sport for Jove celebrates ten incredible years of theatre-making, ten summers of thrilling and surprising outdoor theatre, with our most immersive and ambitious season yet: Shakespeare’s Rose Riot. 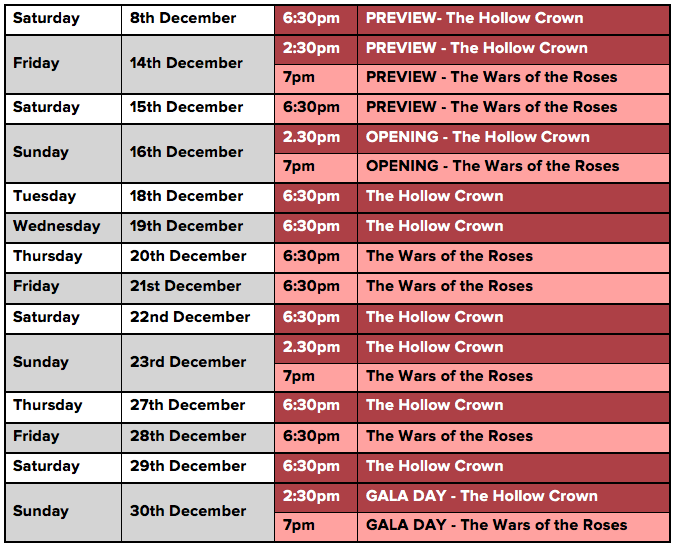 The Hollow Crown (Richard II, Henry IV, Henry V) and The Wars of the Roses (Henry VI, Richard III) will be presented as two distinct but linked productions. Audiences can enjoy either show as a stand-alone production or experience full the cycle by seeing both in one day. Adult $42, Concession $32, Groups 10+ $30, Family bundle (2 Adult, 2 Concession) $120, Children 9 and under are free. Bella Vista Farm is an accessible venue. Public access will be through GATE 2 where there is accessible parking and accessible toilets, there is also another block of accessible toilets at the other end of the farm. All measures to provide the most accessible venue possible have been made, but it should be noted that Bella Vista Farm is a working farm and does not have concrete paths. There is grass matting and hard dirt paths for wheelchair access between the two performance sites. The work of a young Shakespeare, the history cycle is a wild, bold, daring, dangerous feat of storytelling and is among his most illuminating and prescient creations. It is extravagant, violent, funny, fierce and very moving. It could be described as history’s greatest leadership spills. This is riotous summer entertainment at its best. Summer is coming! The Sydney Hills Shakespeare in the Park event is an open-air and all weather event. The performance area and audience seating is completely uncovered. The event is an all-weather experience, and Sport For Jove Theatre Company is committed to going ahead with a performance even in unfavourable weather conditions, unless there is a concern for the general safety of the actors and audience by attending the show. The decision to move a performance indoors can be made up until 30 minutes before the show begins and a cancellation may also be called during the performance. A show is considered to be performed once 60% of it has been staged and it will not be moved indoors if conditions require the remaining portion of the performance outdoors to be cancelled. The Sydney Hills Shakespeare in the Park is an annual event, staged in partnership with the Hills Shire Council, the Festival is a repertory season of plays produced by SfJ at Bella Vista Farm Park throughout December each year. The Sydney Hills Shakespeare in the Park is the brainchild of Hills residents Damien and Bernadette Ryan and was launched as Shakespeare in the Rose Garden in 2009 at the Roxborough Park Rose Garden with Damien’s production of A Midsummer Night’s Dream. Since then the festival has presented SfJ’s productions of Romeo & Juliet, As You Like It, The Taming of the Shrew and Macbeth among others; utilising big casts of professional emerging and seasoned artists, The Sydney Hills Shakespeare in the Park has become a signature event for the Hills District and an anticipated feature of the Sydney Theatre calendar.